I generally like to keep a batch of wholesome sweet treats in the freezer for a pre-gym energy boost - homemade protein bars, peanut butter chocolate protein balls, date balls - that sort of thing. I can get quite light-headed if I work out on an empty stomach, especially if if I go straight to the gym from work, before dinner. (I may have nearly fainted once during a particularly energetic Body Combat class. Whoops). Alternative pre-gym snack: peanut butter on sliced apple. Delicious. 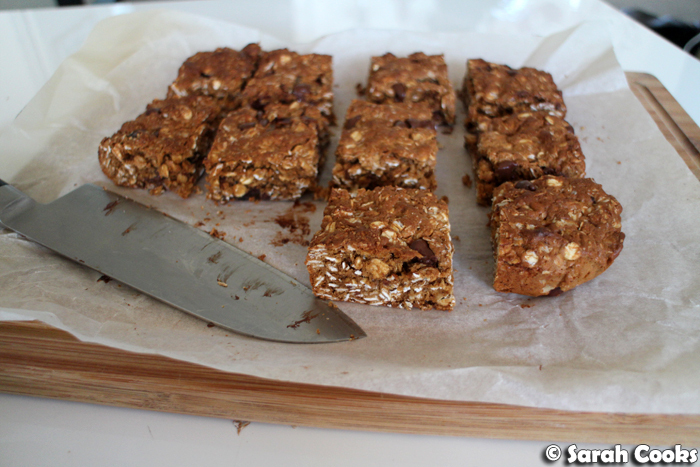 I recently saw these peanut butter granola bars on David Lebovitz' wonderful blog, and thought they'd be just perfect for my pre-gym needs. Or, you know, my general snacking needs. Oats! Peanut butter! Chocolate chips! Yes please! I mixed the recipe up a little bit, using coconut butter instead of regular butter, and using chopped dates instead of dried cherries. I'd bought the coconut butter for another recipe, which I never got around to making, and I felt guilty every time I saw this expensive ingredient sitting forlornly in the pantry. In addition the the ingredients I mentioned above, there's also rich brown sugar (I used a mix of dark and light muscovado), caster sugar, leavenings, a little salt, desiccated coconut, vanilla, and some fragrant spices. So much comforting deliciousness. I'd never used coconut butter before (and it is different from coconut oil), so I wasn't sure if it would work - but it creamed together beautifully with the sugars. 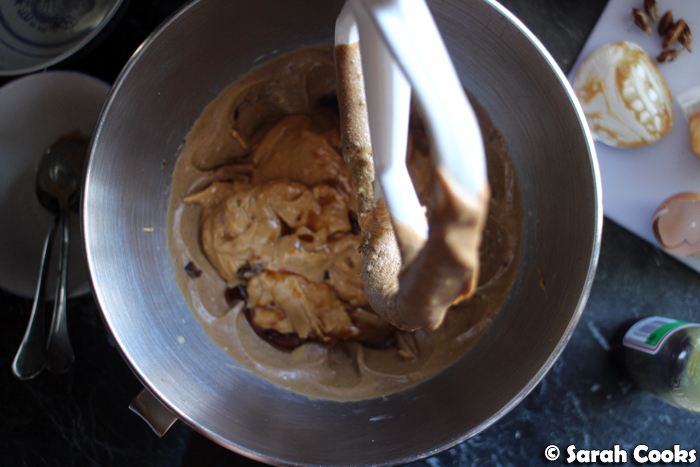 Here's the peanut butter being added! FYI - my favourite peanut butter is Darryl's Peanut Butter, which is made of just roasted peanuts and salt, and is addictively crunchy and flavourful. It's not available everywhere, and I buy it every time I see it at a market or independent supermarket. However, for a recipe like this I think you need a peanut butter that has a more uniform texture - definitely a smooth one, or a standard supermarket brand (e.g. Kraft, Skippy etc.) If you're going for a "natural" brand, I'd try to make sure it's creamy, not one where the oil has separated out and the peanut butter is all dense. Ok! Here's the mixture with all the add-ins mixed through and pressed into tins. I knew these would be good, but I was surprised by just how awesome they were! The peanut butter flavour is prominent - woohoo. They're a bit chewy from the coconut and oats, not overly sweet, with the warmth of cinnamon and ginger, and of course the deliciousness of chopped dates and chocolate! It was very hard to stop eating them straight out of the oven, when the chocolate was all melty and gooey! I shared half the remaining batch with my coworkers (the sustaining snack was greatly appreciated by the busy team), and kept the rest in small squares in the freezer. I've been taking them out a square at a time and giving them a quick blast in the microwave to soften them before eating them. Preheat the oven to 180C. Line a 22 x 33 cm baking pan with greaseproof paper. (I don't have a tin in that size, and used a 20cm square tin and a 20 x 30cm foil BBQ tray, which worked fine). 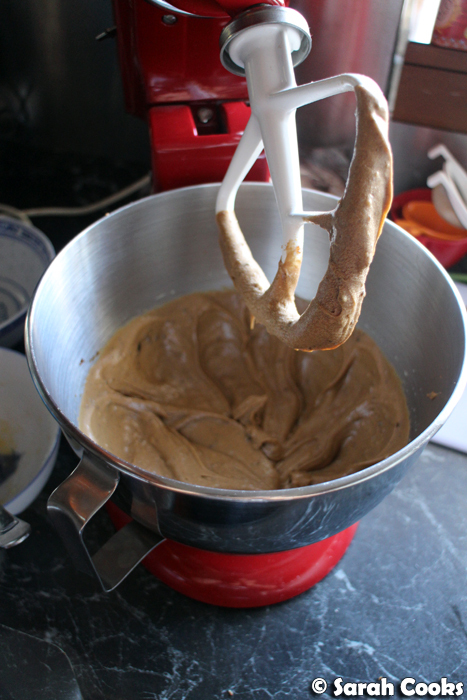 In a stand mixer fitted with the paddle attachment, beat the coconut butter and sugars until light and fluffy. Add the eggs one at a time, beating well after each addition. Add the peanut butter and vanilla and mix. 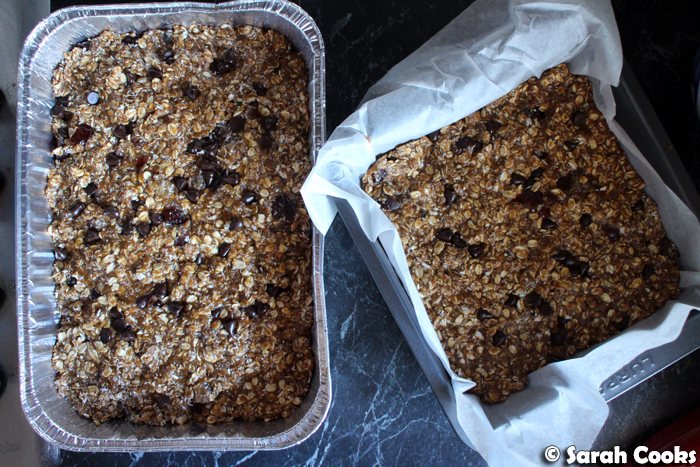 Add the oats, cinnamon, ginger, baking soda and salt. Mix on a slow speed until combined. 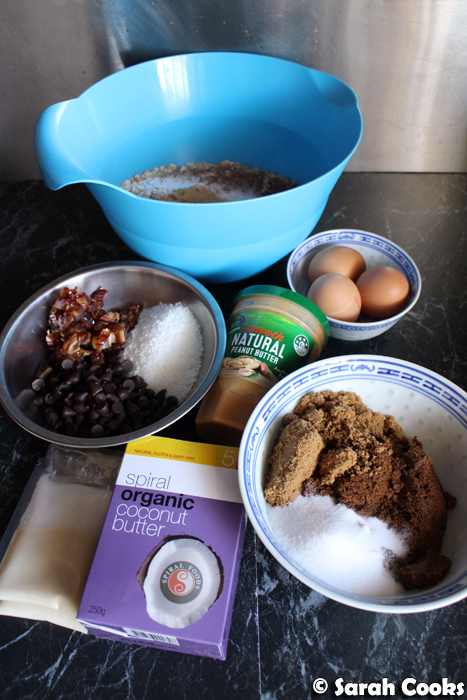 Finally, add the chocolate chips, desiccated coconut and chopped dates, and mix to combine. (You may need to switch to a wooden spoon if the mix is very thick). Scrape the dough into the prepared pan and smooth it out. Sprinkle with some extra flaky salt, and bake for 20-25 minutes, or until golden brown and just set. Allow to cool completely in the tin before slicing. I love Pic's peanut butter. Have you tried that? it's addictive. I must give coconut butter a go too! Oh mah lord these look like the kind of thing I could inhale in one sitting. With cinnamon and ginger too? David is a devilish genius. Yum! I love the idea of using coconut butter instead of regular one for this treat. 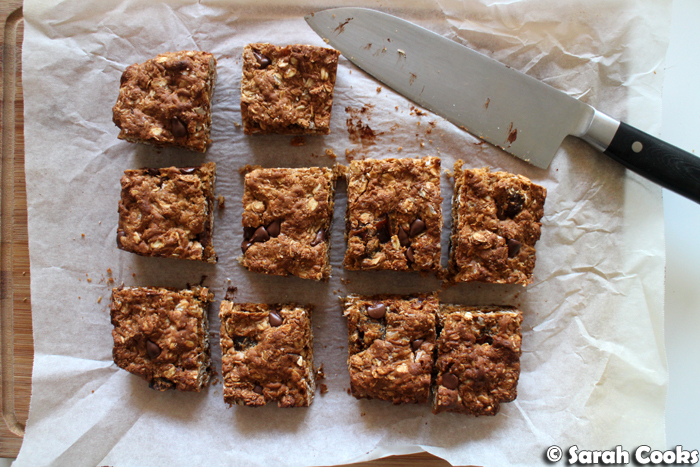 Those are sweet looking peanut butter granola bars!